We have Indoor and outdoor group activities for fun and team building. Choose from a wide variety of our games that are designed for indoor and outdoor. There are thousands upon thousands of team development games out there in the universe. Some are actually fun, some are weird and some are just plain boring. You can search google and get a laundry list of these free or low cost games that will have your staff wanting to call out sick on team building day. They will not be excited or want to participate if you choose to not to hire a professional facilitator that specializes in activities that bring people together. If your employees aren’t happy than you’re not going to be happy. it’s that simple. It’s better to be around others when we are having a good time and doing awesome things at work, right? We have a list of fun team development games you can implement for your next corporate party and/or social event. We have both indoor and outdoor games for company meetings and conferences. We get it, forced interaction with our coworkers isn’t everyone’s cup of tea. Matter of fact, most people rather not interact at all. However, with the right group activities, at the right time and place can actually be quite successful. The key to finding that perfect group activity is not an easy one. First, you must understand your staff and their different personalities. Your employees are going to be inherently different depending on the dynamics of your workplace and company culture. Figuring this out shouldn’t be too much of a daunting task. You may want to consider the demographics and psychographics of your staff. How old they are? Where do they live? What are their interests? Just to name a few. Now that you’ve done some homework, it’s time to start planning some interactive fun! All of the suggested activities can be planned in as little as a week’s time frame. Read on to learn which of these 5 fun team development games that are best for your office or next corporate event. If your staff is composed of mostly tech-savvy, colorful millennials, don’t even try the classics. Outdated antics, like 2 Truths and a Lie or the Egg Drop, aren’t going to impress them. Is your office planning a corporate event that could use a few interesting and fun team development games? You should consider hiring a professional outside vendor to facilitate an exciting, hassle-free game show-like activities for your staff. This particular facilitator should have a fun mental activity that will hold your groups attention all while encouraging them to get to know one another better. We’ve taken the fun of classic game shows and tied them into a team building/icebreaker activity. 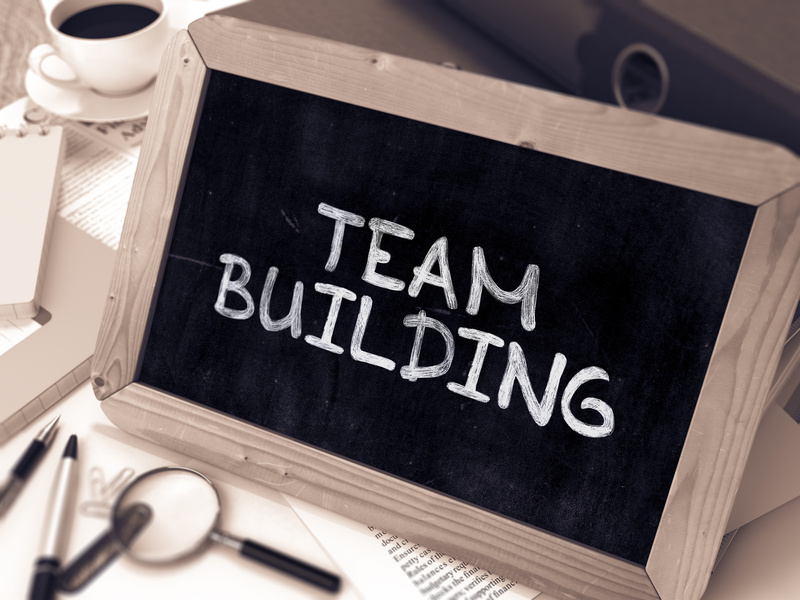 There are so many different team building activities out there that requires you to do some sort of physical challenge. Our only requirement is that you use a muscle that most are afraid to use, their brain. To spice things up before the event, create team names, pick a captain and represent a specific team color. Some companies have added costumes to their team building day which made the activity somewhat historic. 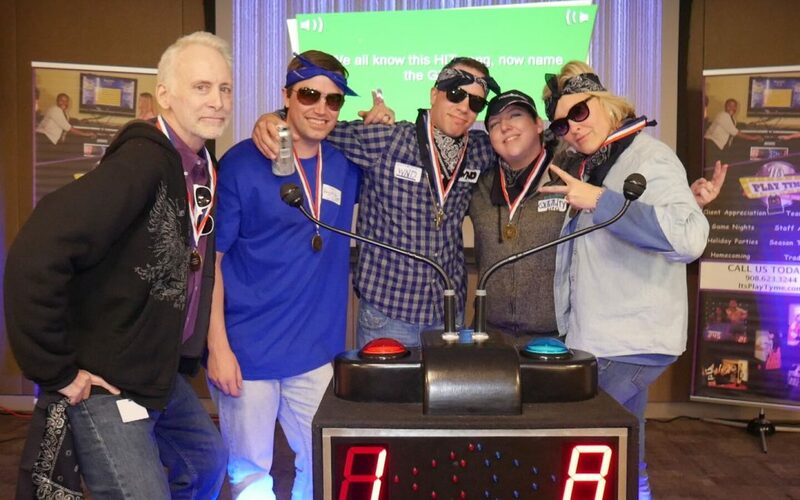 Employees are not accustomed to getting dressed up to play games, but if your a leader who likes to think outside the box, this type of event should be cost effective and a lot of fun. Forget the trust falls, that’s old and outdated. People don’t like doing it. Try something new instead. Take your team bonding outside the office for a competitive activity. This can help develop teamwork skills, boost company morale, and is just downright fun. These can be either indoor team building games, outdoor games or Ice breaker games for your staff. Do you think your staff can keep up? Take them somewhere to burn off all that energy such as paintballing or racing through kayaks. If that sounds a little too intense, maybe visit a local watering hole for a Corn Hole or Skeeball tournament. Does an average day at your office feel like.. well, an average day at The Office? (Unless Michael Scott or Dwight Schrute is plunging through the door, of course). If your staff is a little more reserved (at least with one another), then try a more conversational approach. This can get them to open up, but in an interesting, less traditional way. Some employees be shy and not want to participate at all, but once they see everyone else acting a little silly, they just may join in. Who wants to be left out when it comes to having a good time? 3. What Makes You Weird/Different/Unique Game? This team development game is as easy and low maintenance as it seems. Ask your staff to go around and identify what makes them a weird/different/unique individual. Grab a piece of paper, start writing and pass around the answers. This allows employees to go beyond the traditional ‘get to know me’ questions. It gets them to think and come up with answers that will encourage a more relaxed atmosphere. You can prolong this by adding other adjectives: interesting, brave, thankful, etc. Also, you can make it a points game. The person (or top 3) with the best answer(s) receives a prize. Designate someone in your group to be the leader of this game, and have them come up with another staffer. But they can’t say that person’s name out loud. The other employees have to guess by asking a kinds of questions! However, the questions must be abstract in nature. Think: “What type of music is this person?” or “What flavor ice cream are they?”. Does your office have quite the mix of personalities, age ranges, or backgrounds? Salt and Pepper truly requires effort from everyone’s end. Essentially, you will want to think of common pairs (hence, salt and pepper). Think yin and yang, ketchup and mustard, peanut butter and jelly, and so on. For every 2 employees in your office, you’ll need one pair. Write out each item (salt on one paper, pepper on another). Employees will need to stick these on their backs without seeing what’s written. Have them go around asking one another questions to learn what they are. Once they have figured out who they are, have them find their correspondent. I hope this article was able to give you a few more ways to get your employees bonding? You don’t have to wreck your brain as to what game you want to play. Feel free to Contact us today to learn more about our fun team development games! We have lots of ideas and can hold your hand through the entire process. Don’t hesitate to call. The best part about our consultation is we will be sending you videos and testimonies which will give a real visual of what you can expect from us on that special day. Call 201-357-2979 for more details. No obligation or deposit required upon booking. Let’s Play!